Doulton W9222901 Imperial SuperCarb 10 in. Open Both Ends (OBE) is a highly efficient ceramic micro filter which provides genuine sub micron filtration of drinking water. 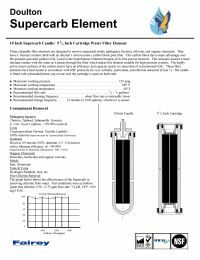 The 10" Imperial SuperCarb ceramic filter is manufactured with the highly consistent and controlled pore structure necessary to remove a wide range of water borne contaminants over the life of the ceramic cartridge. In addition to find particulate matter, bacteria, cysts, and turbidity are removed to a high level of efficiency. 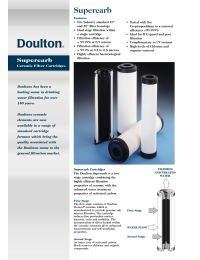 The Doulton Imperial SuperCarb ceramic filter incorporates silver locked within the ceramic structure inhibits the growth of bacteria and gives each cartridge enhanced bacteriostatic and self-sterilizing properties. *NOTE: We recommend upgrading all SuperCarb Candles or DOE filters with the Ultracarb for the added benefit of Lead Reduction and other heavy metals. First Stage: The first stage consists of Doulton Sterasyl ceramic which is manufactured to provide genuine sub micron filtration. 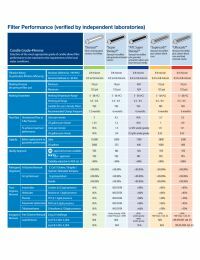 The cartridge reduces fine particulate matter, bacteria, cysts and turbidity. Second Stage: The incorporation of silver locked within the ceramic structure inhibits the growth of bacteria and gives enhanced bacteriostatic and self sterilizing properties. Third Stage: Packed with granular activated carbon which removes chlorine, VOCs and industrial solvents.